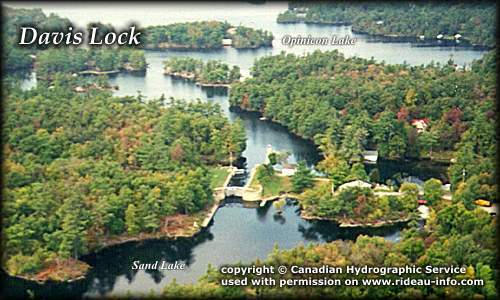 Of Interest: Davis is known as a “solitude lock,” one of the most remote locks on the Rideau. It’s named after Walter Davis Jr. who built a sawmill here in about 1818. It features the best preserved example of a defensible lockmaster’s house on the Rideau. Built in 1842, this stone house served as home to the local lockmaster until 1959. The building was fully restored in 1999. The view, from this house into Sand Lake is, except for the navigation buoys, essentially what Colonel By would have seen when the canal opened in 1832. Notes: Gas is available at Sand Lake Marine. No local services. Solitude lock. Davis Lock looking WestA view of Davis Lock with part of Sand Lake in the foreground and Opinicon Lake in the background. Known as a "solitude lock" Davis lock is located literally at the end of the road.